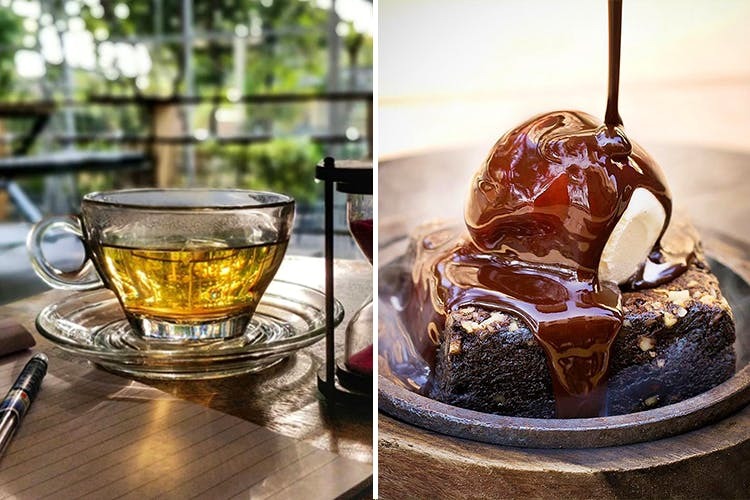 Tea Villa Cafe is a franchise that was started in Mumbai by Micky Panjwani and Roopanshi Bhatt, two professionals who were in search of a more soulful career path. With one outlet in Viman Nagar already, their second outlet was opened in Baner. as of June this year. They serve a long list of some of the world's best teas (nearly 100 varieties), and pure vegetarian dishes spanning Indian, Continental, Italian, Mexican, and Mediterranean cuisines. Both indoor and outdoor seating options are available - the latter even has a nice vertical garden - in their typical Tea Villa-style. Choose from a lavish all-day breakfast spread, or go for sandwiches, burgers, bagels, accompaniments like flavoured fries, soups, salads, multi-cuisine starters, pizza, pasta, main course, sizzlers, fondue (cheese/chocolate), and dessert. Tea aficionados, we suggest trying the Lavender Earl Grey, smoked Lapsang Souchong, South African organic Rooibos (red bush), silver needles white tea, and flowering green tea (available in peach/guava/lychee flavours). Prices are a little steeper than your average chai spot, but for this kind of quality and variety in tea - we think it's worth it. For eats, try the cheese fondue, sizzling waffles, cheesy pull-apart garlic bread, melon arugula salad, and loaded freakshakes. Remember to check their display counter for their daily-special selection of desserts! We've heard various complaints about the service here, and hope that they work on improving that. We're also eager to see them open more outlets in Koregaon Park, Deccan, Camp, etc - so that we won't have to travel far for a good cup of chai, and a meal! Tea Villa Cafe is pet-friendly, so you can take your four-legged companion with you.